An intense week has gone by. I'm trying to sort out my life, trying to find time, drowning in it all. I've had to schedule my TOEFL test, which took 11 days to do. Why is the ETS office for all of Africa in the Netherlands? I sent them a fax: then waited. I sent them an email: waited some more. Got some so-called automated responses back. Tried to register online, which failed. Finally they replied to tell me that the test centre in Johannesburg only offers the internet based test, not the computer based test (which is what my registration form was for). I was informed that I had to resend my info, which makes no sense. Surely it's just one office? Surely both kinds of test require some ability to read off a computer screen and type things on a keyboard? By some miracle, I managed to register online later that afternoon. Now I have to wait for the 28th of April, which is the earliest date I could register for. All of this to prove to the people at Colorado State University that I comprehend English. I watch South Park. My speaking English won't help. I'm also trying to finish up some research posters for the SAGS conference in Bloemfontein and something called the IPRI conference in West Lafayette, Indiana. Luckily, I'm going to neither, as I have plans for the beginning of April. The posters will be presented on my behalf by other people. Being the control freak that I am, I'm trying to make them really comprehensive, as I have no real idea of what's supposed to be on them, or of what'll happen to them once they leave my hands. So little sleep. So very little sleep. On the 3rd of April, two days after I turn 25, I will witness Depeche Mode in concert at Wembley Arena. I 'discovered' dM in 1995, the year after their record-breaking 7 dates at the Standard Bank Arena in Johannesburg. But a year too late, nevertheless. For the past ten years I have spent more money on my passion for this band's music than on anything else and longed for the day when I, too, may hear them perform live as so many countless Northern Hemisphere fans have done. Now it's all actually happening and the nervous tension makes it very difficult to concentrate on work. I'm paranoid that something's going to go wrong, that the universe won't allow me to have this one moment, this thing that I desire so badly above all other things. It'll be the second time in my life that I travel abroad and the second time in a year, at that. Who doesn't become addicted to travelling, once they've tasted it? The world is so full of amazing stuff, and it's all disappearing so fast. I feel a compulsion to hurry, hurry, hurry. Madagascar, before it burns down; New York, before it becomes too expensive; Ecuador before it gets turned into a golf course; Mexico, before I'm too old. Too old, like my father...now. 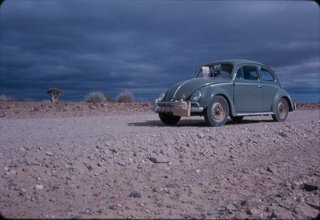 The photo accompanying this post is one my father took in November 1965, on a trip to Namibia, when he just started out. If you look closely, you can see Coke bottles and a box of Ouma rusks on the bonnet of the car. It was an escape, away from work and people, away from his so-called family, away from the orphanages in Pietermaritzburg, East London and Johannesburg where he grew up. The Namib is timeless and forgiving and will swallow anything, given enough time. It's a place where you can become more of yourself. Although my father doesn't talk about himself much, I know that this trip was a defining moment for him. And then he met my mother - his family - and came home to stay. Where are you seeing Depeche Mode? 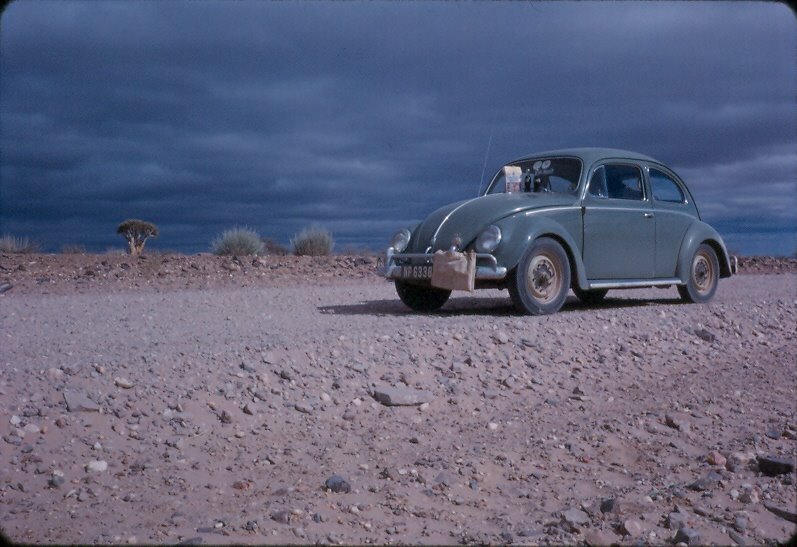 *sigh* I'd love to be in the Namib now! I'm applying for a PhD in Cereal Genomics at Colorado State University, but there's a lot of paperwork and interviews and forms and things, which depresses me to no end. We're going to see dM at Wembley Arena on the 3rd of April. Buying those tickets was the single most stupid, impetuous and awesome thing I've ever done and I'm so looking forward to it.